Hariharan Krishnamoorthy, 29, did his schooling in Thiruvananthapuram and then completed a degree in mechanical engineering at Regional Engineering College, Surathkal—now National Institute of Technology, Karnataka—before joining IBM straight from campus. 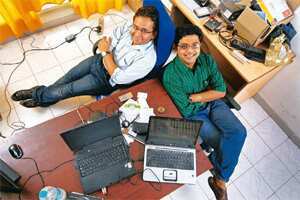 While in engineering college, he ran into Ashutosh Upadhyay, 28, his eventual partner at LordsOfOdds.com. Upadhyay’s own route to the college was a little more circuitous. “I desperately wanted to get into St Stephen’s (New Delhi) but couldn’t, so (I) decided to opt for engineering as the second option. I got into a state engineering college very near home. But I didn’t find it exciting at all, so (I) decided to travel down south, much against the wishes of my parents," Upadhyay recounts. The young men joined college a year apart but were members of the same clubs and became good friends on campus. But while Krishnamoorthy went to IBM, Upadhyay joined TVS, where he worked on “our desi 100cc and 125cc bikes". Upadhyay was the first to turn entrepreneur. “I got bored in a year’s time at TVS" and started a boutique human resources consulting firm that expanded from two to 35 employees in two years. In the meantime, Krishnamoorthy went through the MBA programme at the Indian Institute of Management, Calcutta, and then joined an investment bank in Mumbai. A year later, in 2004, he decided to take the plunge: “I am a sports buff and most of my plans and ideas had something to do with sports." Upadhyay joined him later. “Sports-related fantasy gaming was one of the ideas I had explored at one time in IIM-C," remembers Krishnamoorthy. During one of those business school “come let’s start something of our own" thought sessions, Krishnamoorthy and a group of friends began talking of how betting was big business in the UK. “During one such discussion, we hit on an idea of creating a fantasy game that will capture the thrill of betting and can provide information through concepts of prediction markets." Krishnamoorthy started by looking at some London-based real money betting sites. He then tried to apply this to India, where betting is illegal. Out of this was born LordsOfOdds. When you register at the website, you get 10,000 loots (LordsOfOdds tokens) to bet on the games on the site. The site captializes this by selling it to advertisers. Users do not have to pay to register or play. Says Krishnamoorthy: “Everything went contrary to expectations—technology, hiring, people, attrition, finances, marketing, selling—things were way different and tougher than what we had anticipated. In the beginning it seemed very simple: Create products in six months, go to VC and get money and live happily ever after. Things went wrong at every stage." Krishnamoorthy recalls his family being supportive throughout, and Upadhyay’s joining the firm was a fillip. “We decided to revisit and rework parts of the business plan and that seems to be paying off now. Things have improved tremendously from then on." Krishnamoorthy says he would persist with sports, but with something related to marketing. “If there is something you decide you have to have, it will come to you. When everything seems lost, look at things positively, you will see pieces in the jigsaw falling in place," Krishnamoorthy says.